My brother and sister are classically trained musicians. I grew up in a house where I spent weekends curled up on a couch constipated over Dostoyevsky and Chekov as I listened to my sister shake the ear wax out of our neighbors with relentless strains of Tchaikovsky and Chopin. When she left, my brother took up the viola and resumed the neighbors’ mandatory classical music education. Even when I wasn’t at home, I heard them play when I hung out at their music schools or attended their performances. My distress was understandable then when I moved to Cagayan de Oro nearly a decade ago and discovered the absence of my usual auditory comforts. There were no public performances of classical music then. There was only the perennial videoke. The videoke, by the way, is an excellent machine when in the hands of superb vocalists like my father-in-law. It becomes a tool of torment however, when entrusted to screaming banshees intent on letting us personally inspect their tonsils while singing in keys that have yet to be identified. I would vote for any senatorial candidate who promises to draft a law making prolonged singing by people without talent a crime. The classical concert scene eventually crept into Cagayan de Oro with the inauguration of the Rodelsa Hall in 2005. The problem is that it costs an arm, a leg and some internal organs to get tickets to a show. 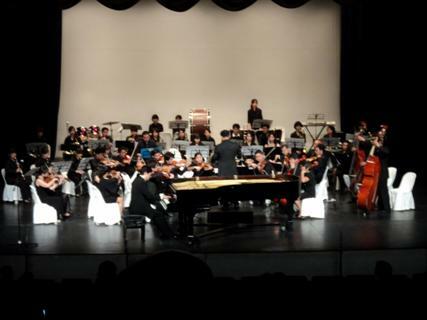 I had to crack open a piggy bank to get tickets and clothes to watch the Cebu Philharmonic Orchestra, the UUU Orchestra (Japan) and Rudolf Pelaez Golez perform at the Rodelsa Hall last Saturday. I had to watch. Some of the musicians were members of the same orchestra my brother played in before he left Cebu. More than the music (which was superb), what I was after was the comfort of memories, of my lazy days on a couch listening to the work of musicians who suffered from depression while reading depressing literature. Strangely, I count those as happy times. I wonder if the music meant anything to the rest of the audience. Except for the infernal sound of Cherry Mobile in between pieces, the audience was incredibly polite and gave the performers a standing ovation. But were they being more than polite? When more pressing concerns such as hunger, poverty and security have been significantly addressed, my hope for Cagayanons is that we’ll find meaning in classical music if only because its true value lies in its ability to comfort, elevate and liberate the human mind and spirit. I never learned to appreciate classical music. You are lucky to have a family of musicians around you. I loooove Classical music! It has a different calming effect compared to reggae and jazz which I also like. Besides, classical music has a lot of benefits, especially for kids. Okay I'm rambling, but indeed, I agree that there needs to be more appreciation for this genre. Had I gone to the same concert and decided to share some thoughts about it, I might have ranted over the Cherry Mobiles. I went to the CCP Open House last month - watched the Philippine Philharmonic Orchestra, the Madrigal Singers, and more for just PhP100, HOHOHO - and there were sooooo many phones ringing. Everywhere. All the time. I wanted to kill someone. But yes, I wish CDO would have more 'cultural' offerings. Manila is an ugly and dreary place, but gawd, the talent showcases that overflow here. i like music of different genres depending on my mood :) i really wanna learn classical music... my impression of people who can play it in orchestra are very talented and have deep sense of artistry :) you are lucky you've been trained!